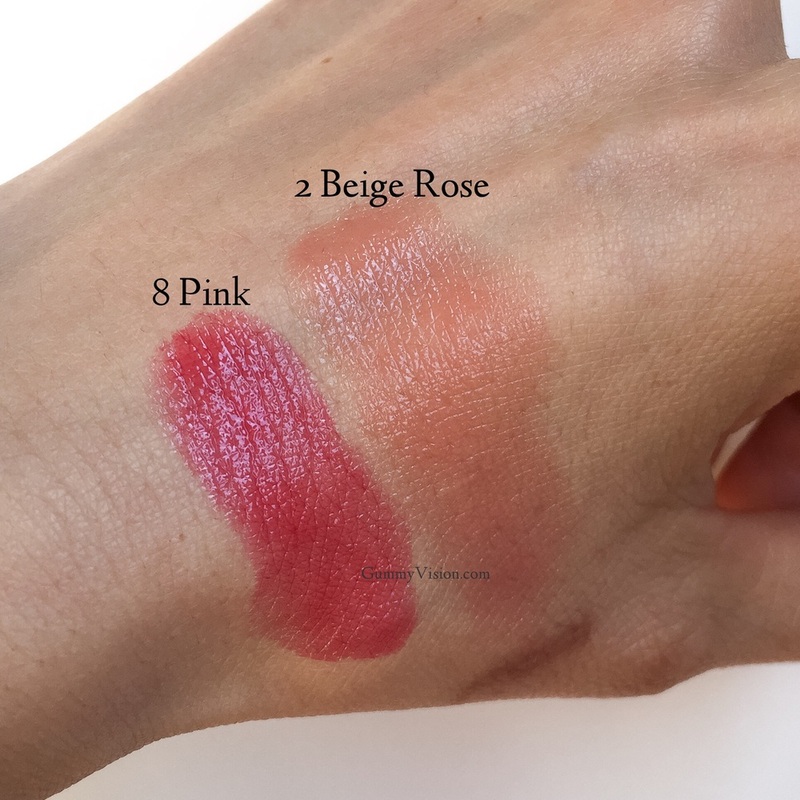 Last year, I started exploring Sisley products, and started off with the Phyto Lip Twist last Spring. I ended up selling that in a blog sale, but decided to try an eye cream later in the year. The Eye and Lip Contour Cream was a 2014 Skincare Favorite and nudged Shiseido Benefiance out of the top Holy Grail spot!! Not an easy feat, as I had been loving the Shiseido for 8 or 9 years!! ***All items purchased by me. Affiliate links included. I flat out love the packaging. The squared off edges speak to my OCDness (hello easy to organize ha ha!! ), and the combo of gunmetal and clear acrylic make the tubes look sleek and modern. And this does have a little weight to it. As far as color, 8 Pink (pictured on the left) isn't pink. Nor is it Red. I guess it falls somewhere in the Red family, with a hint of pink? It's definitely more vibrant and punchy than a classic red, and makes for a great pick-me-up kind of color :-) And I think the 2 Beige Rose description is pretty accurate. This is a little thicker, but not gloopy or too thick. By nature of being a gloss, it does have some tack to it, but it's not too sticky. I find this formula hydrating and comfortable enough to wear all day, and it provides a little cushion so you don't feel like it's going to slide right off. Late afternoon sun, one swipe patted with finger. Patted down you can see a bit more of the pink undertones in 8 Pink. I really love both colors like this, and feel they really add a little dose of happy whether worn alone or layered :-) They might not be super unique to the eye, but once applied they just work really well with my skin tone & lip pigment. Shade, 1 swipe patted with finger. Despite the brush applicator, I'm very happy with these 2 glosses!! The formula and colors more than make up for it, and I get to smile inside whenever I pull out the beautiful tubes. Sigh :-) This is why we love makeup, right?!! And...ahem...Barneys Love Yourself event should be coming up soon...might be an idea if you are looking for things to try! !